The Danish astronomer Tycho Brahe first became interested in astronomy when he realized that it could accurately predict the eclipse of the sun. During his time, the planetary tables astronomers used were inaccurate, which was a problem that he set out to change. Brahe was born in Knudstrup, a town which is now in Sweden. He was a twin, but his twin died shortly after birth. His parents were aristocrats, but when Brahe was a toddler he was taken in and raised by his uncle. He entered the University of Copenhagen at around age 12 and stayed there for six years. On November 11, 1572, the first new star to be noticed in 1600 years appeared in the night sky in Cassiopeia. Brahe’s observations proved that this object actually was a star and, as a result, disproved the old idea that the heavens were immutable. The star was actually a supernova, SN 1572, which was the remnants of an exploded star. In 1577, Brahe also destroyed the idea that comets originated in the earth’s atmosphere. He showed that the Great Comet of 1577 was actually a body that moved through space. Brahe worked on the island of Hven in Denmark for more than 20 years. He also built the Uraniborg and the Stjerneborg for him and his students to further their astronomical research and studies. The island had been granted to him by Frederick II, King of Denmark. However, Brahe ran afoul of the government and moved to Prague in 1597. There he enjoyed the patronage of the Holy Roman Emperor, Rudolf II. Brahe not only studied astronomy, but drew up horoscopes for the court because astronomy and astrology were considered to be closely related. To Brahe, the placement of the planets always seemed very different from where they were actually observed in the sky. 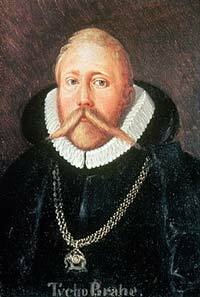 Brahe decided to observe the planets in a systematic way and to observe them every night over a sustained period of time. Other astronomers had performed their planetary observations when the planets were in critical points in their orbits. Brahe’s new technique of observing the planets may have been one of his greatest contributions to astronomy. While in Prague, Brahe also met Johannes Kepler, the German astronomer. Kepler became his assistant and used Brahe’s observations to confirm and refine the Copernican system, which Brahe had rejected. Tycho Brahe also studied at the University of Leipzig as well as the German universities of Wittenberg and Rostock, then the University of Basel in Switzerland. While he was at Rostock, Brahe fought a duel with a Danish nobleman. The nobleman cut off a bit of Brahe’s nose. After that, Brahe wore a prosthetic that was allegedly made of gold and silver, though he may have worn base metals for everyday use. Brahe used this disability to his advantage, for it inspired him to take up the study of alchemy and medicine. Tycho Brahe died in 1601 after a banquet. Most reports say that he died from a urinary or kidney problem, but some scholars believe he was poisoned. One of the murder suspects, interestingly, is Johannes Kepler. Also, there is a theory that his brother murdered him, too. Brahe’s body is buried in Prague.